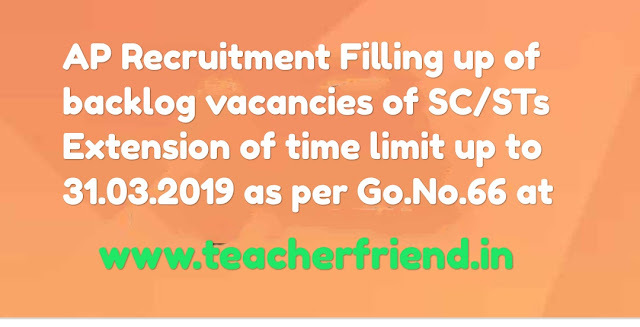 AP Direct Recruitments filling of Backlog vacancies of Scheduled Castes and Scheduled Tribes Extension of time limit up to 31.03.2019 as per Go.No.66,Dated: 18-04-2018/AP The time limit is being extended from Direct Recruitment time to time to fill up the backlog vacancies of Scheduled Castes and Scheduled Tribes up-to 31.03.2018 as per G.o.No:66. Recruitment Filling up of backlog vacancies of Scheduled Castes and Scheduled Tribes Extension of time limit up to 31.03.2019 order issued as per Go.No. 66, Dated: 18-04-2018. U.O.Nnte No.3437/CV.ROR/2011, dated:08.04.2018 of Social Welfare Department. In the G.O. first read above, an adhoc rule was issued to fill-up the backlog vacancies of Scheduled Castes and Scheduled Tribes duly waiving the written examination and interview so as to fill up the identified backlog vacancies. The time limit is being extended from time to time to fill up the backlog vacancies of Scheduled Castes and Scheduled Tribes up-to 31.03.2018. Government have decided to extend the time limit for filling up the backlog vacancies of Scheduled Castes and Scheduled Tribes as on 31.03.2018, for a further period up to 31.03.2019. To fill up the backlog vacancies in Group-IV services under the purview of District Selection Committees, orders were issued in G.O. 2nd read above. To extend the time limit for filling up the backlog vacancies, the following amendment is issued to G.O.Ms.No.215, G.A. (Ser.A)Deptt., dt:08.05.2001 and as subsequently amended from time to time. In exerci. of the powers conferred by the proviso to article 309 of the Constitution of India and of all other powers hereunto enabling, the Governor of Andhra Pradesh hereby makes the following amendment to the Adhoc Rules Issued in G.O.Ms.No.215, General Administration(Ser.A)Department, dated the 8. May, 2001 and as subsequently amended from time to time. In the said Adhoc rule, for the expression "before 31st March, 2018", the expression "before 31st March, 2019" shall be substituted.